I absolutely love an icebox cake. They’re easy, delicious, and are a fun and different dessert. And I’ll admit to being a purist when it comes to the cool confection. The old fashioned version with Nabisco chocolate wafers and whipped cream is my favorite. But those wafers can be really hard to find and when you do find them, they’re usually pretty expensive. 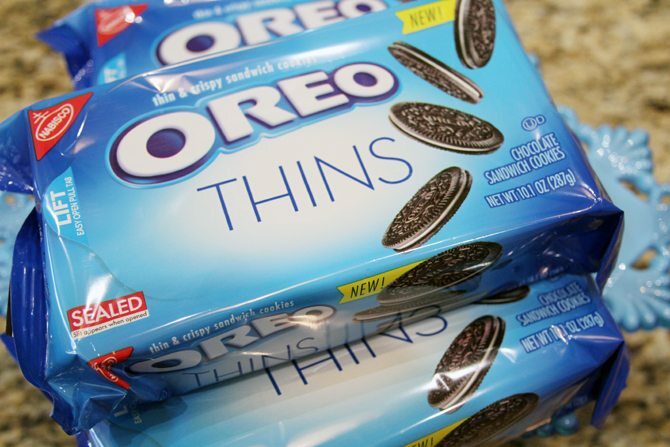 Enter the Oreo Thin. Y’all know my obsession with everything Oreo (Oreo Delight, Oreo Ice Cream), so it’s probably no surprise I’m the one searching the stores each time a new Oreo flavor comes out. For me, most of them haven’t really compared to the original, but that’s not the case with the Oreo thins. I really love the crisp thin cookie and while I’m usually Double Stuff guy, the amount of cream in the Thins is perfect too. But I’m getting off topic here… they’re good. You get the point. Start by adding the whipping cream to a mixing bowl and whip it with a hand or stand mixer until soft peaks form. Add the sugar and vanilla and mix until it is incorporated. In a small bowl, stir the softened cream cheese until smooth. 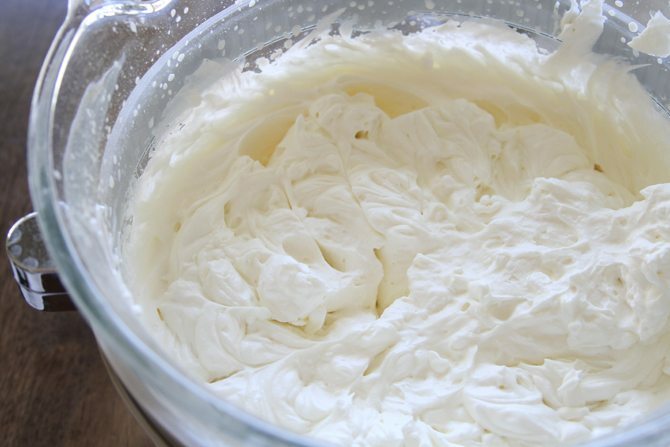 If you need to, zap the cream cheese in the microwave to get it super soft, just allow it to cool completely before adding it to the whipped cream. 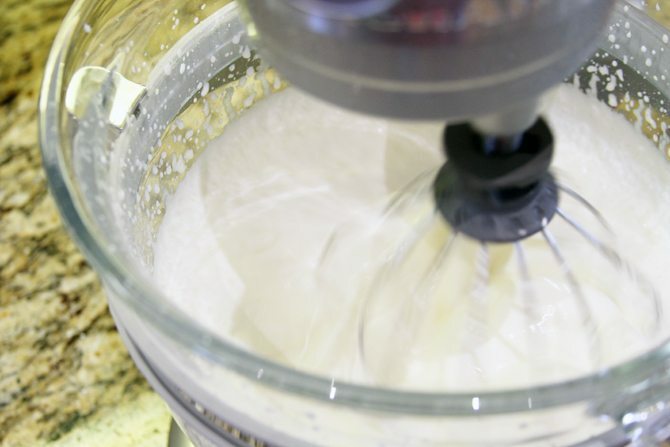 With the mixer on, gradually add the softened cream cheese to the whipped cream and mix until it is well incorporated. Choose a plate or pedestal that will fit into your refrigerator with the cake on it, because this will have to stay refrigerated. 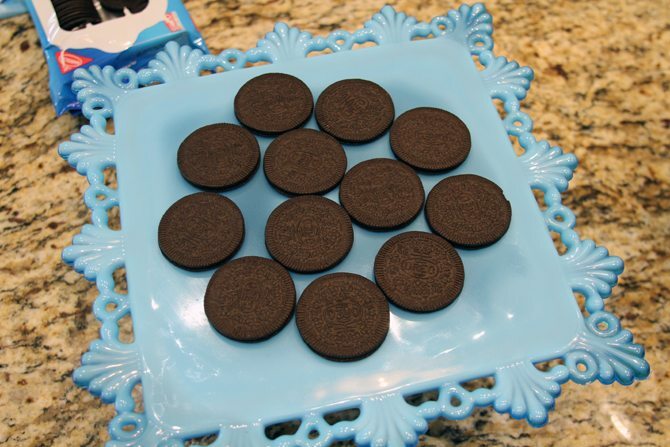 Take 12 Oreos an arrange them in a circle on the plate – 9 cookies on the outside ring, 3 in the middle. 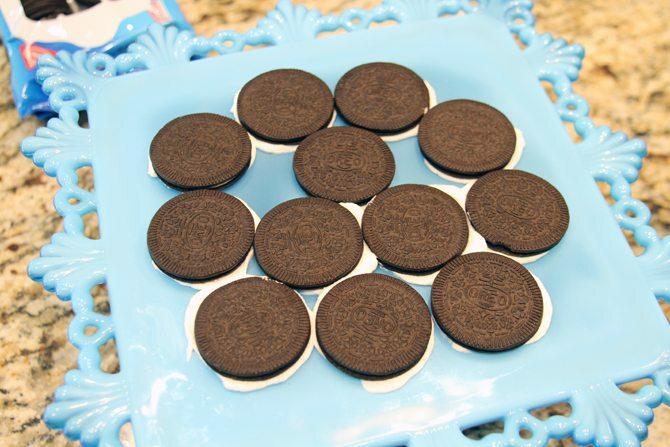 Then lift each Oreo and put a little whipped cream on the bottom and stick it to the plate in its position. Next top the Oreo layer with a layer of whipped cream. I used about 1/2 to 3/4 of a cup between each layer. 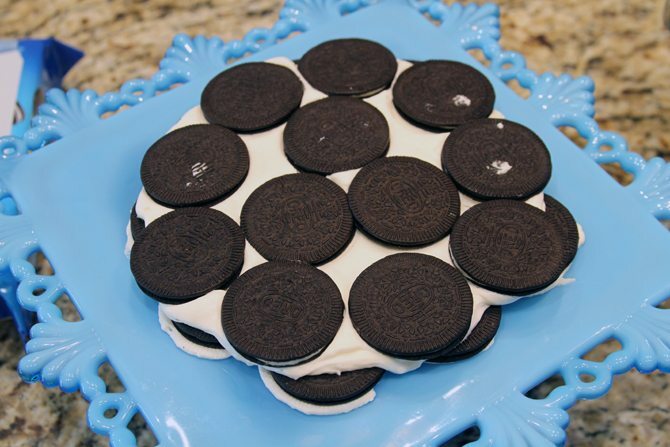 Spread it thin, leaving a little bit of each Oreo exposed on the edge. 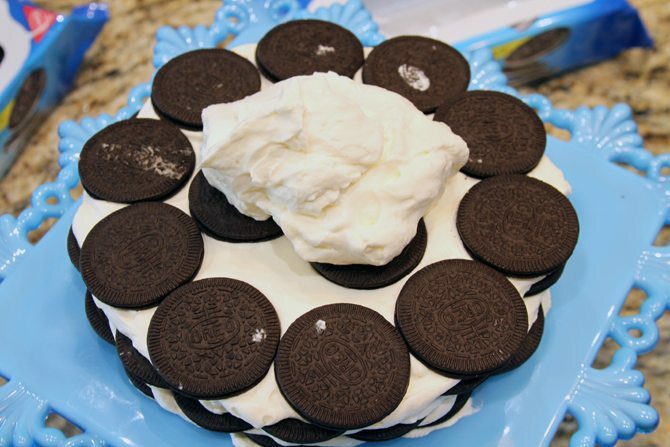 Stack another layer of 12 Oreos on the whipped cream – being sure to stagger them in each layer. That helps to keep the cake together. 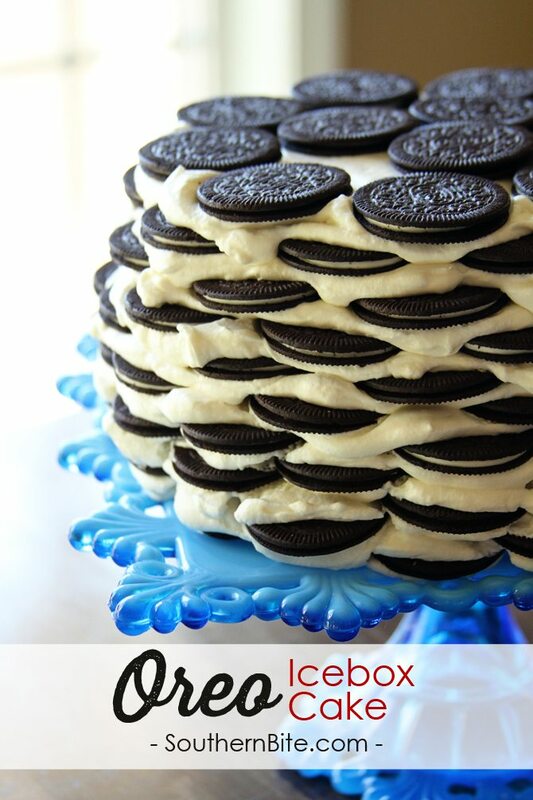 Stacking the Oreos on top of one another would allow it to fall apart. Once it’s put together, you’ll need to refrigerate it for at least 4 hours but preferably overnight. The cookies will absorb the moisture from the whipped cream and will soften to allow you to cut it perfectly – just like a cake. Y’all enjoy! In a large bowl, whip the heavy cream until soft peaks form. Add the powdered sugar and vanilla and mix well to combine. In a small bowl, stir the softened cream cheese until smooth. The cream cheese can be softened in the microwave, but allow it to cool completely before adding it to the whipped cream. 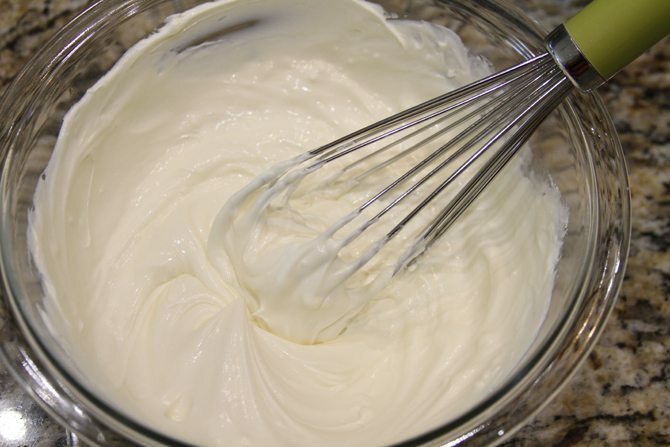 Gradually add the softened cream cheese to the whipped cream and mix well to combine. 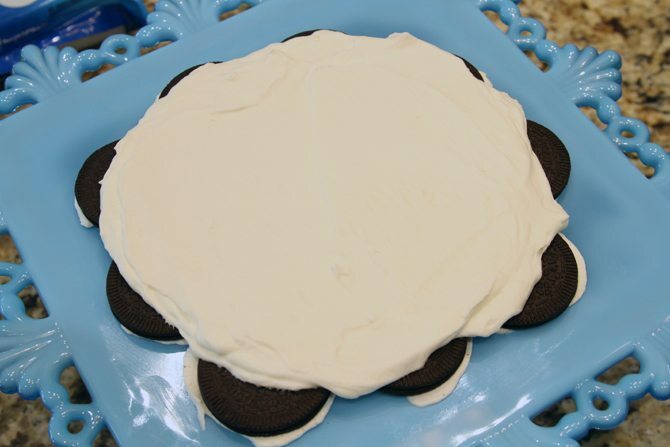 On a cake plate, arrange 12 cookies in a layer with 9 in the outer circle and 3 in the middle. Once arranged, lift each cookie and add a little whipped cream to the bottom then stick it back to the plate. Repeat until all the cookies have been secured. Top with 1/2 to 3/4 cup of the whipped cream spread to the edges but allowing the edges of the cookies to be exposed. Add another layer of cookies on top of the whipped cream being sure to stagger the cookies on top of the ones below - don't stack them right on top of one another. Repeat the layers until all the cookies have been used. Chill in the refrigerator for at least 4 hours but preferably overnight. Slice and serve as you would any other cake. Keep chilled. Be sure to check out the picture tutorial on SouthernBite.com. Very impressive for such simple ingredients. It looks like a fancy pastry shop dessert. For a buffet or shower, I could even envision adding some mint leaves, cherries, flowers, etc. just to gild the lily. Exaactly! Those are some great ideas to put it over the top! This looks sinfully good. I would love to see what a slice of it looks like. I’ll see what I can do. It slices beautifully! OMG!! This is gorgeous and looks so amazingly good!! I am so anxious to try the recipe and think it will be for Easter weekend!! If dont have whipping cream can you sometimes substitute whipped topping?? Stacey you said keeping it round was the hard part then why not use a spring form pan? That would make it easy to keep round plus easy to take the sides off. Well, you certainly can, but you’ll need to cut the recipe in half. This full recipe would make a cake much too tall for a spring form pan. Looks so good and is so beautiful. 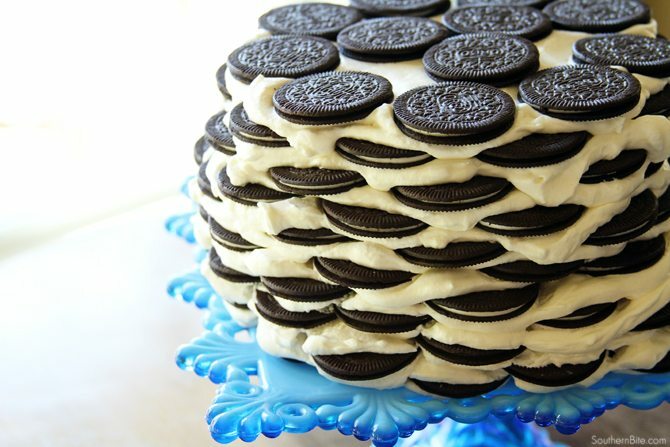 I’m sure my Oreo loving husband would love this cake. As much as I like the looks of the cake I am totally loving the cake plate. It has to be one of the prettiest plates I have ever seen and the fact it’s a square one (my favorite) just adds to it. I wish I knew more. I love it, but essentially know nothing about it. How do you cut/slice it without it falling apart? Nice it has chilled for the correct amount of time, you’ll have not trouble cutting it. The cookies soften and it cuts beautifully! I make a chocolate chip icebox cake that is like this one. You can do store bought or bake your favorite recipe for chocolate chip cookies. It is divine, too! Everyone enjoys it. Many are questioning how to slice it without falling apart. After it sets for at least 4 hours..he recommends overnight, and, I agree. The cream mixture will soften the cookies, so when you cut the cake it doesn’t crumble..it stays moist like a cake. I can’t wait to try this one. Going to be on our Easter buffet for all to enjoy! Thanks so much, Lynn! And you’re absolutely right, it cuts beautifully! Now onto to your version of the cake… I CAN’T WAIT to try it! 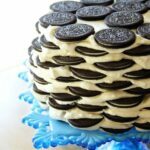 Hi Lynn, I’m very intrigued to try the chocolate chip version of this cake, as well as the Oreo. I’ll be making my own cookies, but wondering if it’s done the exact way? Exact filling? Exact a out of cookies and are the cookies placed right side up or upside down. Thanks so much! Would it be possible to freeze this after assembling, transport it in a cooler, and allow to defrost and serve the next day? Thanks for this great recipe; I can’t wait to try it! It seems like it should work fine in theory, though I’ve never tested it to be say for sure. I’ve only ever made it with the thin ones. 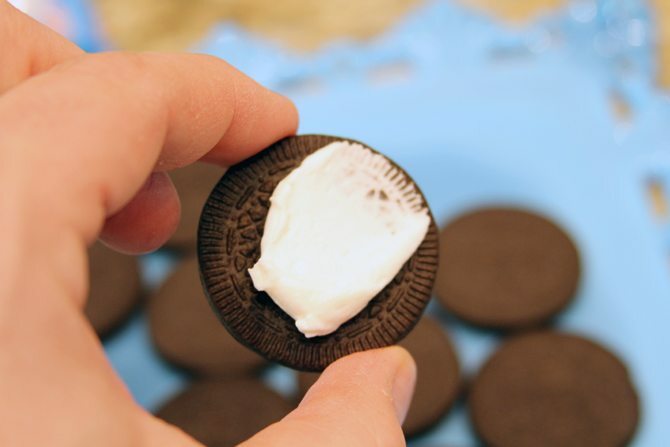 My fear is that the regular Oreo’s are too thick to soften completely which would make it very difficult to cut. I have been wanting to make a “chocolate wafer icebox pie” for years but it has been impossible to find Nabisco Famous Chocolate Wafers. Then I saw Oreo thins in the store & immediately had the same idea. Chalk it up to great minds think alike or there is nothing new under the sun. Ha! Either way, it’s delicious! I am making this for July 4th and going to put a little red and blue sprinkles on the edges. Fingers crossed!